In 2018, the RRJWRD completed a 2018-2022 Water Management Strategy. Outline water management and development goals. Provide an inventory of specific actions that will help the RRJWRD meet its water management and development goals. Outline target timeframes for the completion of those actions - providing a gauge for measuring performance and success. Continue relationships with North Dakota, South Dakota, Minnesota, and Manitoba to further flood damage reduction efforts within the Red River Watershed of the North. 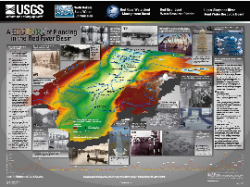 ​The U.S. Geological Survey, ND State Water Commission, Red River Management Board, Upper-Sheyenne River Joint Water Resource District, and RRJWRD proudly announce the availability of an educational poster entitled "A History of Flooding in the Red River Basin." The poster can be downloaded from the USGS website. Or, paper copies of the 30X40 inch poster can be requested by calling the State Water Commission at (701)-328-4989, or email swc@nd.gov.